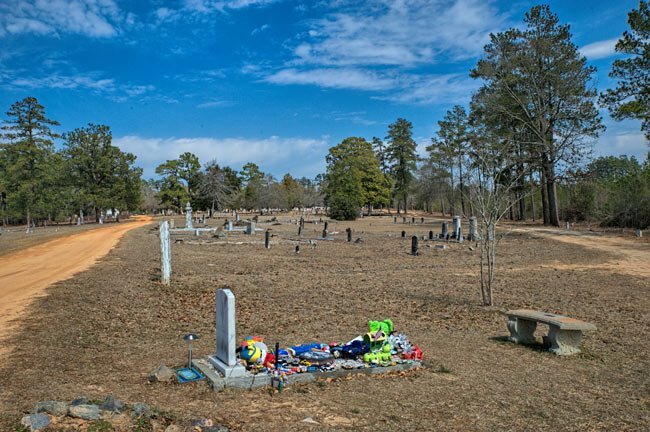 The Graniteville Cemetery was established in 1850 by William Gregg, the industrialist who founded the Graniteville Mill and its surrounding town. 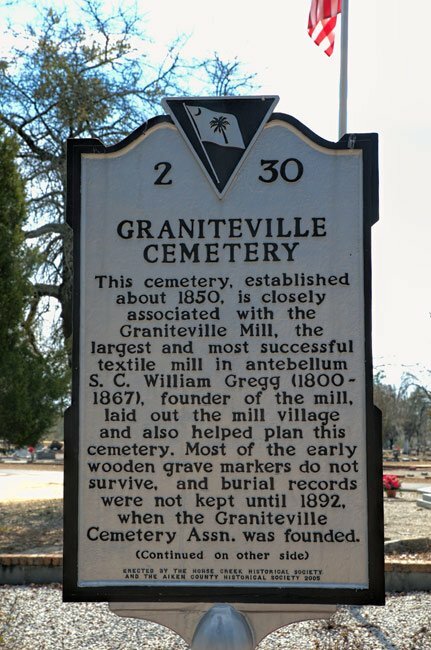 The cemetery inters people from Graniteville but also serves the nearby mill communities of Warrenville and Vaucluse. This gate has been placed here by the Gregg-Graniteville Foundation, Inc. to commemorate the devoted service of the citizens of Graniteville, Warrenville, and Vaucluse in defense of our nation’s freedom and democracy. 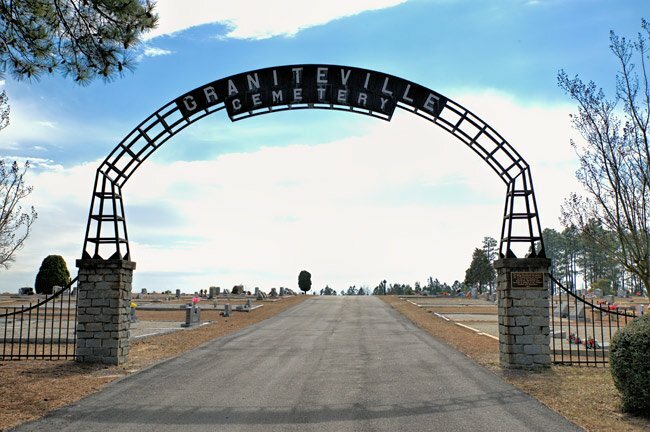 Though most markers are now made of standard granite – also the state stone for which the town is named – early graves were denoted with wooden markers made of cedar. 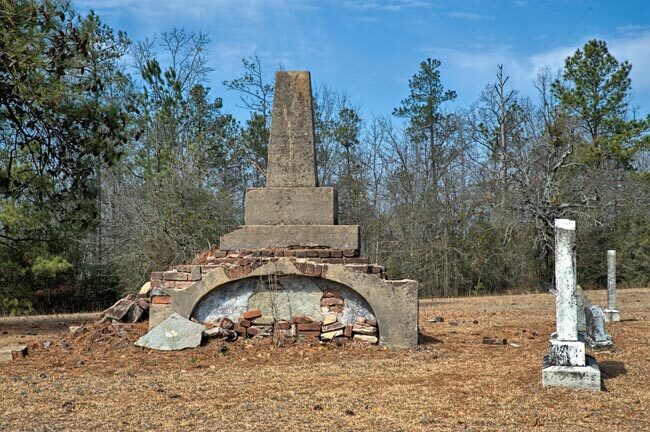 A few of these primitive markers can still be found within this historic cemetery. William Gregg was interred here following his death in 1867, and an obelisk was erected to commemorate his burial site (the image above is of a different memorial). 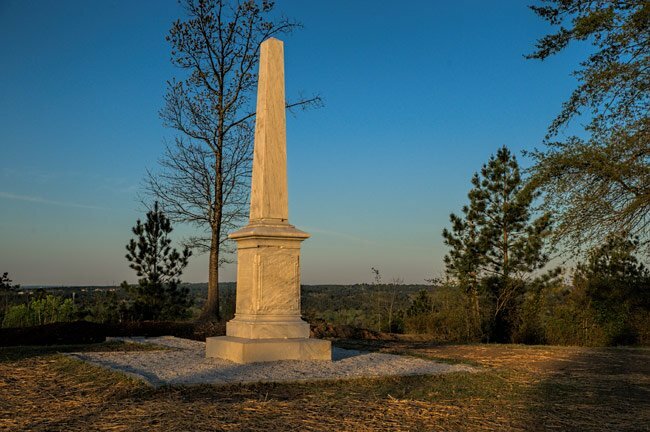 Though is wife, Marina, moved his grave and the monument to Magnolia Cemetery in Charleston in 1876, his daughter returned Gregg’s obelisk in 1926 to the cemetery within town he helped build. 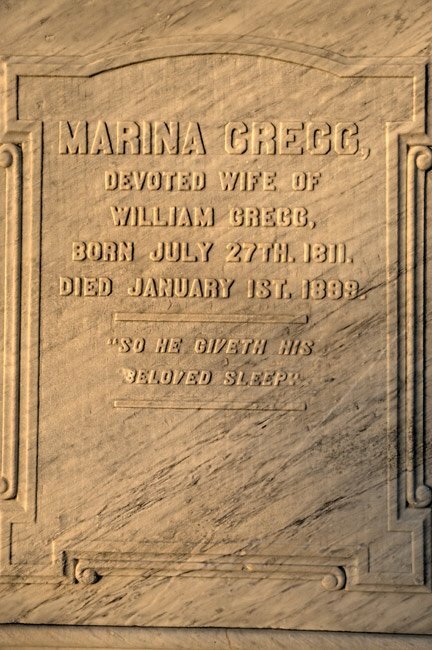 Though William Gregg is no longer interred here, the Graniteville Cemetery is the resting place of his wife, Marina Gregg. Her monument can be seen in the two above images. Also buried here is James Wesley Rearden. Rearden was a faithful employee of Graniteville Mill and even occupied Gregg’s former home overlooking the textile factory. He worked for the mill for 87 years, from 1872 until his death in 1959. Some say Rearden’s continuous time working at the Graniteville Mill may be a record for an industrial laborer. 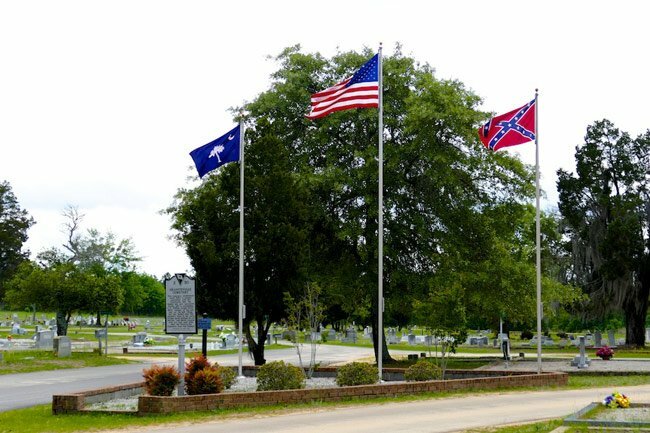 The cemetery is also the final resting place of 83 Civil War veterans. 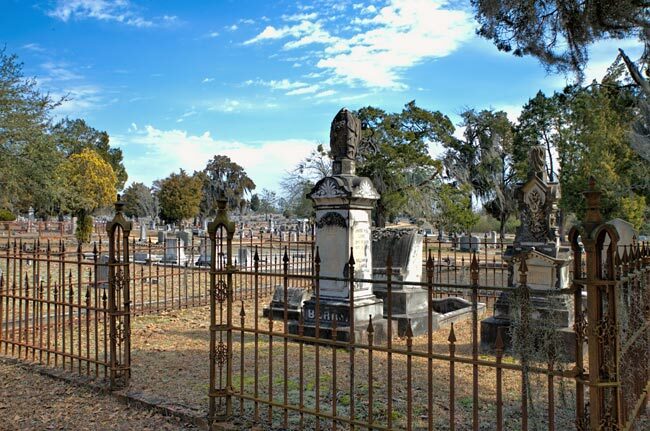 It is maintained by the Graniteville Cemetery Association. The most famous grave inside the Graniteville Cemetery belongs to someone whose name and identity remain a mystery. Known only as “Little Boy,” the child was buried here by well-meaning strangers in the fall of 1855. The story says that a boy around the age of 12 was traveling alone by train when he arrived ill in Warrenville. Too sick to communicate, the boy was taken in by Mr. and Mrs. Henry Senn, proprietors of the Graniteville Hotel, to be nursed back to health. Sadly, the boy died before anyone could learn his identity. 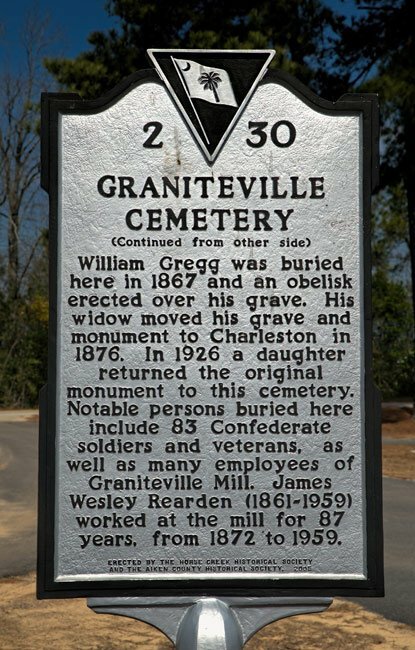 The people of Graniteville generously collected money to have the boy properly laid to rest, with William Gregg donating the plot. A cedar marker watched over his resting place until enough money was eventually collected to provide the child with a headstone. The headstone suffered damage after decades of marking the boy’s grave, and it was replaced again with a new one some time after 2010. 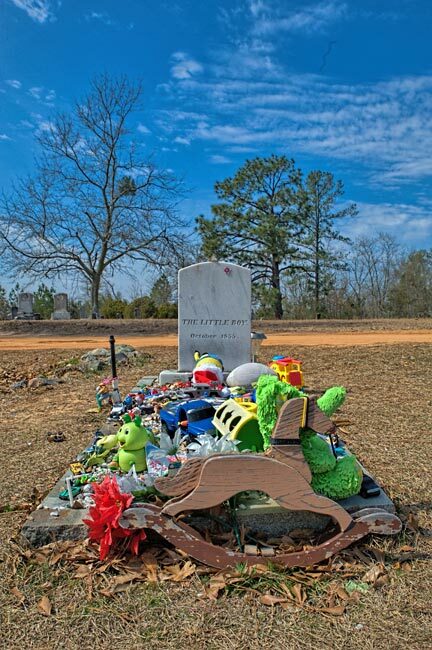 Locals and visitors to the cemetery continue to look after the lost child who died in Graniteville, leaving toys and flowers on his grave to show that he was cared for at the time of his death and is still remembered. The sadness of the boy’s story lingers over the mill town, inspiring those who remain in Granitveville to claim him as their own. 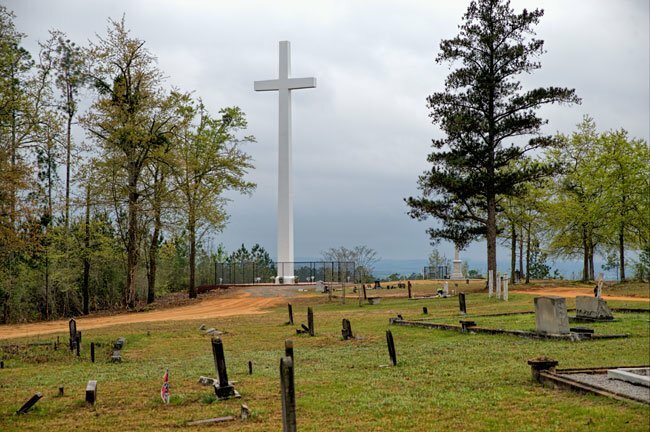 On April 2, 2015 the non-profit group Megiddo Dream Station dedicated a 92-foot-tall steel cross on property it owns within the cemetery. The organization is a Christian-based group that helps people attain employment. Private sponsors donated towards the creation of the cross, which was installed in late March. 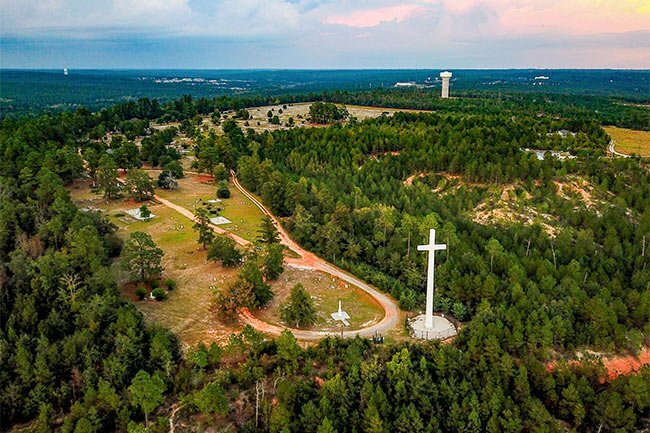 The cross, which stands at eight-and-a-half stories tall, was made by Mississippi-based company Headrick Signs and Graphics. The 33,000 pound- structure is illuminated at night with flood lights and can be seen from the town of Graniteville and possibly even beyond. Is there a cemetery plot map? Would like to acquire one if possible. Thank you. Findagrav.com can be a very useful tool. In this case, the precise burial location of Jack Fortune isn’t given, but there is a photograph of his stone (which is in need of some TLC). Go to the website and search for Jack Fortune in Graniteville and you’ll find him. I hope you’re able to get a better location within the cemetery. Search results did not return a lot of help when we looked, but we did come across this number on the Graniteville Cemetery Facebook page (803-663-9224). We hope it helps! Who do I contact to find where an exact grave is? I am looking for the Grave of Jack C. Fortune. He was KIA in WWII. Sept 22 1918 – Sept 11 1944. Captain US Army Air Corps. He is the namesake of American Legion Post 205 in Augusta.